CHOR BAZAAR WORKSHOP: New Shirts Coming Soon! We hope everyone is excited that spring has arrived? With it comes the beginning of t-shirt weather, YEAH! 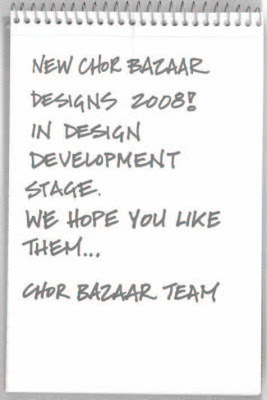 We have been busy designing new designs for our latest edition of Chor Bazaar t-shirts for 2008. The new designs are going to be a bit more artsy and creative than our current designs. We also feel that they are a lot more original than previous ones. Not that our old ones are bad, it is just that would like to believe that we are getting better with age and experience. We would love to hear from you and enjoy the warmer weather.